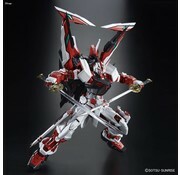 The Gundam Astray Red Frame appears again in the Perfect Grade series, sporting its Tactical Arms II L accessory! An upgraded version, the Tactical Arms backpack can convert into multiple forms including neutral V-Form, Sword Form, Arrow Form, Delta Form, and Work Form! In keeping with the "Red Frame" designation, the movable frame around which the Perfect Grade series is designed is molded in red, with a completely articulated structure for exciting and flexible posing. Shoulder units can extend outward for expanded range of movement. Elbows feature multi-joint construction, allowing complex poses such as drawing the sword. Stomach unit features full articulation, including "hydraulic" cylinders. Knee armor designed to move along with poses. Calf frame extends and retracts. Battery-powered light-emitting diode (LED) system can be switched on to illuminate the eyes. 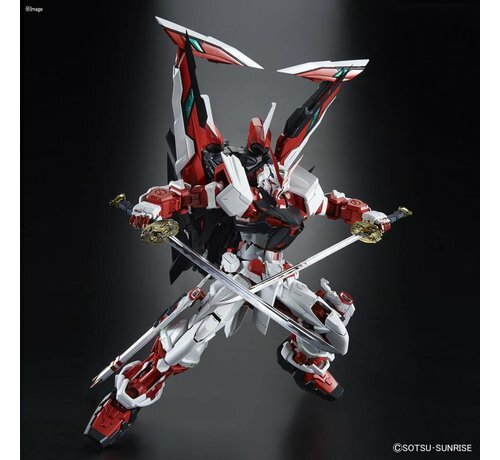 The Red Frame Kai's other signature weapons, the "Gerbera Straight" and "Tiger Pierce" swords, feature separate blade, guard, and pommel construction just like real swords. Blade portion is chromed plastic for a realistic finish, and features engraving on the lower part of the blade. Guard and pommel-end are gold chromed plastic with detailed sculpting. Blade is designed so as to be fastened in the pommel with rivets. Additional accessories include detachable beam torch and Action Base for displaying the Tactical Arms IIL in its various forms. Includes instruction manual and water slides. CR1220 battery for LED sold separately. *This is a P-Bandai item. Quantity is limited and is likely to not be re-produced for a few years.